As a business owner, you should ask yourself how your business stands out on a daily basis. In a competitive economy, it is important to stay top of mind with your potential customers. Research has shown that the ambiance of a store has a huge impact on a consumer’s behavior. One of the best ways to create an inviting ambience and stand out is to boldly assert your brand with outdoor lighting. The benefits of effective commercial outdoor lighting can really make your brand ‘shine bright’. Bright lighting that mimics your brand is a sure way to attract customers and stand out from the dimmer competition. Seeing your brand, logo, or core sales message lit up makes for quick recognition. Both making customers feel safe and keeping the criminals at bay should be a top priority of any profit-seeking commercial entity. Outdoor lighting removes the darkness and obscurity of a venue, providing a very functional purpose. If you are smart with your outdoor lighting, you can strongly communicate your brand messaging by choosing a shape, colors, and location of the lights that best represent your brand personality. 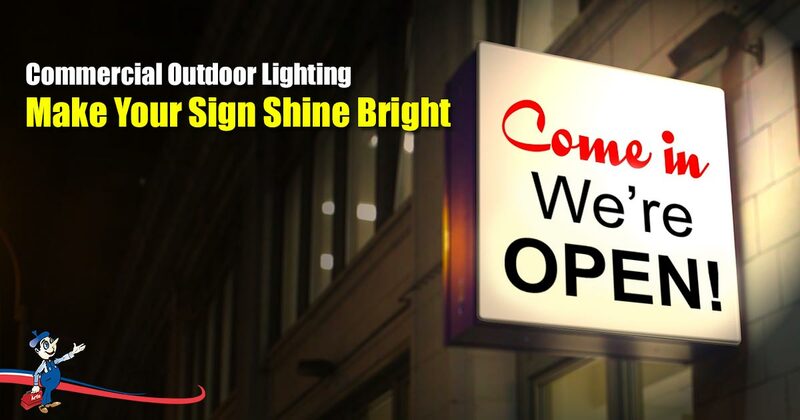 Outdoor lighting, especially in the evening, communicates that your business is open and increases curb-appeal. How do you decide which outdoor lighting to choose? There are several lighting variations for you to choose from, depending on your needs. Neon signs offer high visibility, an opportunity for creative design and night-time functionality. Not to mention, they have long lifespans and are energy-efficient. These lights are used to light up the underside of outdoor canopies. They are ideal for providing cover in wet locations. You may associate canopy lights with gas stations, drive through restaurants, and covered parking spaces. Flood lights provide a potent lighting output and are best used when light is needed to cover a large area for example in a buffet. These lights provide a narrow and elongated light. They are often used in parking areas, placed on the underside of the covering. Pole-mounted lights are popular on streets and open parking lights as they cover a large area with a wide beam. Wallpacks are self-contained lighting features that are used to light the immediate area around a building rather than covering a wide area surrounding. These are great for branding and are popular in a variety of businesses such as restaurants and bars, hotels, coffee shops, banks, and hospitals. Light boxes are known to do wonders for advertising a brand. As a result, many bold and creative brands use light boxes as a way to achieve great exposure at a low cost. These are available in several forms and fulfill the main purpose of creating an aesthetic. One example is tree lighting which is used as a great way to create an ambience for a special event, promotion or season. While it is beneficial to invest in outdoor lighting for your commercial site, it is wise to do so in a way that saves you money where possible. Choosing the correct lighting, getting them professionally installed and insisting on regular maintenance checks from a qualified commercial electrician will improve the longevity and effectiveness of your lighting choice. Use low-voltage and energy saving bulbs that are efficient, last longer and reduce energy bills. Consider the benefits of an LED bulb. Keep your lighting well-maintained. There is little worse than when the name of your company dims out on a vital letter. Regular maintenance will keep your outdoor lighting looking professional and effective. Stick to your brand guidelines. If your brand is bold and vibrant then choose a lighting structure that reflects your brand. If you have a softer brand, then choose softer lights and shapes. Ensure functionality. Ask yourself what the purpose of the lighting is – is it decorative or functional? If the purpose is to light an area for vision, consider installing features such as motion detection, scheduled controls etc. These smart lighting techniques will ensure that your commercial outdoor lighting serves a valuable purpose while simultaneously keeping energy bills to the minimum. Consider light placement. It is important to think about which paths your customers will take, providing you with an opportunity to outline their walkway. At the end of the day, when the lights come on, good lighting position is important for business. While it pays to be creative with your approach, it pays even more to be functional and well-maintained. At Art Plumbing, AC & Electric, we know how to strike this balance and meet your needs – give us a call for more info.